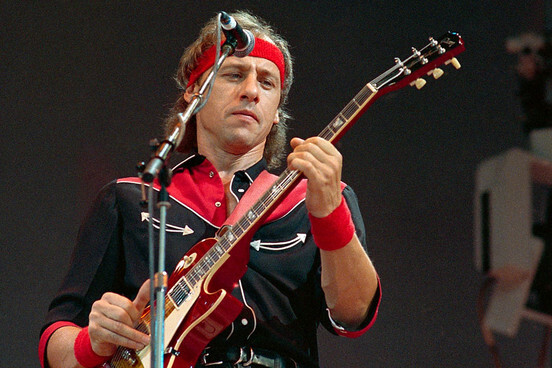 Whilst enjoying Mark Knopfler’s considerable guitar skills and knack for writing cinematic ballads (‘Romeo And Juliet‘ and ‘Private Investigations‘ would probably make my top 20 songs of the ’80s), Dire Straits’ mega success has generally puzzled me. Knopfler always seemed a Bob Dylan/Randy Newman/Donald Fagen kind of guy – subtle, intelligent and wry/wary – but Straits’ mostly meat-and-potatoes rock music told another story. But Brothers In Arms hit at exactly the right time on its release in 1985; its digital sheen, beautifully-crafted songs, tasty drumming (Omar Hakim, except on ‘Walk Of Life’ and ‘Money For Nothing’) and mastery of various styles (ZZ Top-style boogie, roots rock, jazzy pop) created an ’80s perfect storm. It’s so much part of the furniture that it’s almost beyond criticism. Knopfler’s laidback, post-Dylan vocals are a great antidote to all those oversingers of the ’80s (and right up to the present day). On ‘So Far Away’ and ‘Walk Of Life’, his pitching is not perfect and his phrasing throwaway, but the overall effect is pleasing possibly because it’s such a contrast to the super-slick production and playing. And he shows himself again to be a brilliant ballad writer – ‘Your Latest Trick’ carries on from where ‘Private Dancer‘ and ‘Private Investigations’ left off, a noirish classic featuring a famous sax break by Michael Brecker just as memorable as ‘Careless Whisper’ (for better or worse!). ‘Why Worry’ and the title track (apparently Knopfler’s response to the Falklands War) are timeless epics. I found myself unexpectedly very moved listening again to the latter the other day. In fact, I was surprised how generally downbeat the album was, not having heard it for a good few years. Brothers In Arms outsold both Michael Jackson releases (Bad and Thriller) to be the UK’s best-selling non-greatest hits album of the ’80s, spending 14 weeks at number one. Surely a big reason for its success was that it was heavily promoted as a digital recording and as such was perfectly suited to the new CD format. The fact that it was the ‘test CD of choice’ for yuppies on the lookout for new hi-fi equipment must have been a delicious irony for Knopfler and Straits manager Ed Bicknell, given the lyrics to ‘Money For Nothing’. There were even rumours that at the time other artists were struggling to get their albums pressed onto CD due to the overwhelming demand for Brothers In Arms. Happy birthday, chaps. This entry was posted in 1985, Album Reviews, Dire Straits, Pop, Rock and tagged Brothers In Arms, brothersinarms, Dire Straits, direstraits, Mark Knopfler, markknopfler. Bookmark the permalink. Given to me on vinyl as a birthday present August 1985 together with Little Creatures. Neither album entranced me back then. Little Creatures I still find a bit boring – what with its lack of the afrobeat / industrial / goth / disco influences of their other albums. Brothers In Arms though I think has probably improved with age. Mainly because bands can’t make albums like that anymore. The money isn’t there. There also would never be as much acceptance by a record company of that many different styles on one record. Or a record that relies on so much standard decent songwriting without lots of gimmicks. Good combo, Straits and Heads. Agree with you about ‘Little Creatures’. Yes, the variety on ‘Brothers’ is really striking, it’s way out of reach of current ‘pop’ artists. Almost every song is over six minutes long too.